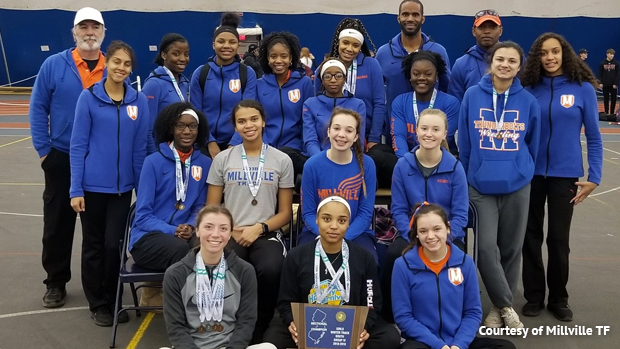 For the Millville girls this continues to be a historic season, they won their first State Relay title in January and now their first indoor Sectional. 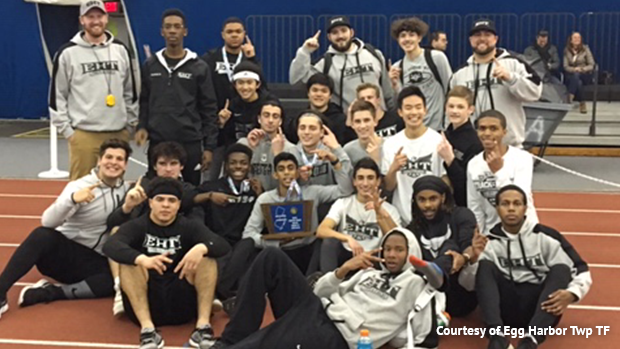 Egg Harbor Twp has now won this South Jersey Group 4 Section six of the past eight years! And this is their second in a row. The Millville girls scored 60 points, a 24 point lead, and did so by scoring in every single event. Raelynne Miller scored three times individually running 2:21.13 for fourth in the 800m, 5:16.91 for third in the 1600m, and 11:47.03 placing sixth in the 3200m. Leah Ellis and Malea Broome went third and fifth in the 55m hurdles running 8:46 and 8.54. Broome also ran fourth in the 55 dash at 7.47. They had a 3-5-6 finish in the high jump with Kenny'a Dunns and Ellis over 5-0 as well as Bryanna Craig's 4-10. Craig got it done on the track as well running to third in the 400m with a 59.11. Malayshia Andrews was third in the pole vault at 8-06 and Tereana Parker second in the shot put with a mark of 37-01.75. Brionah Patterson also scored sixth in the 400m dash and their 4x400m closed the meet with a strong second place finish at 4:05.80. Egg Harbor Twp boys finished with 47 points, ahead by five over second place Cherokee. They rode four first place finishers to victory. Trey Henry won the 55m dash running 6.62. 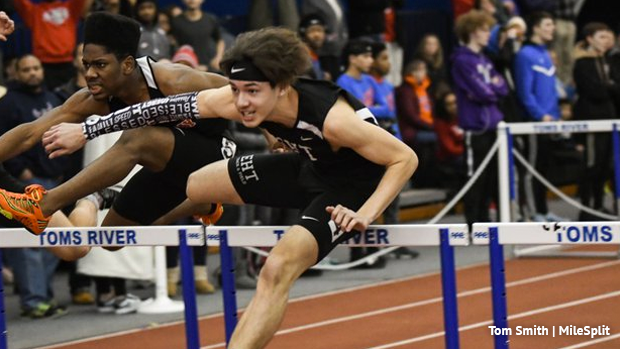 Anthony Vazquez won the 55m hurdles finals at 7.81, had a 7.82 in prelims. Mubeen Momodu cleared 6-02 to earn the W in the high jump and Joshua Cohen vaulted 14-01 for first in the pole vault. Ryan Lagroteria was fourth in the vaults at 12-06. They also picked up points in the 4x400m where they finished fifth and the 800m run thanks to Gobi Thurairajah's 2:01.83. Other highlights from this meet... Ian Moore of Rancocas Valley won the 800m running 1:59.37. Kingsway's Stone Caraccio posted a winning 4:23.36 in the 1600m. Cherokee's Ethan Wechsler took home the 3200m with a time 9:32.27. Daniel Fenton of Millville winning the 400m at 50.36. Jackson Memorial posted the third fastest 4x400m time of that first Sectional weekend at 3:26.99, their thrower Collin McCarthy also earned a win in the shot put at 53-01.5. On the girls side.. Jewel Ash of Eastern Regional ran 58.33 in the 400m. Shelby Whetstone of Lenape 2:19.28 in the 800m, her teammate Alexis McDonald cleared 5-02 to win the high jump. Kate Rathman of Cherokee had a double gold kind of meet with 5:11.84 in the 1600m and 11:23.30 in the 3200m. Claudine Smith of Atlantic City clocked 8.09 to win the 55m hurdles. Maria Mezzo of Southern Regional vaulted 10-06 and Bryanna Wilson of Howell won the shot put at 40-09. Rancocas Valley finished out the meet with a 4x400m victory at 4:04.13.